​Darlene Noerenberg Schille is sure quilting is in her blood from the time she was a small child playing under her mother’s quilt frame. Growing up in Maywood, Illinois, she graduated from Bradley University, married, and came to Naperville, where her interest in antique needlework grew. She collected homeless, but heart-warming, old quilts from flea and antique markets through the years. Then she began a sweater business in which the arms, backs, bottom edges, and necklines of cardigan sweaters were knitted by her sister, while she made the fronts with pieces from antique quilts. It was a popular item and they sold many. Darlene’s home is adorned with lovely pieces, many those same old quilts she found in dusty places, others she has made lovingly by hand. Patterns are what usually catch her eye and spark a new quilt idea. She particularly enjoys the Missouri Star Quilt Co. (www.missouriquiltco.com) and the Piece O’ Cake ladies, Becky Goldsmith and Linda Jenkins (www.pieceocake.com). She does some machine quilting, but her favorite techniques in the past have been hand applique and hand quilting. But now, she is really into piecing! Likewise, her favorite color-way in the past has been the Civil War palette, but now she is enjoying very bright colors. Darlene is a Guild charter member and has co-chaired both philanthropy and hospitality committees, each several times. 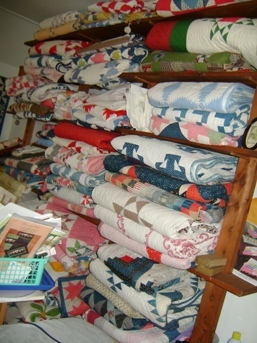 She is enthusiastic about the great number of quilts made by members for donation to philanthropic causes and wishes we had more time and space to display them at meetings. 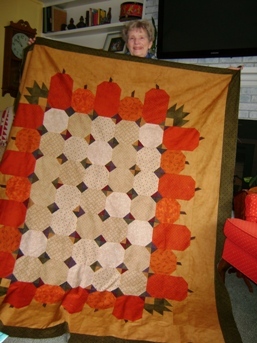 She is a member of the dwindling Traveling Needles bee as well as the Naperville Grace UM Church weekly quilt group. A longtime member of Grace UM Church, she also taught nursery school there for twenty-five years. When asked, Darlene speaks of her fifty-three years of marriage to her dear Curly Noerenberg, whose passing changed her life. Soon after, she called upon an acquaintance, Joe Schille, who had offered help with any household problems. Romance bloomed again and they soon married. That’s how conversation is with Darlene. She makes you feel like you've come home to family and can relax and chat a while about anything, whether it’s family or quilting.